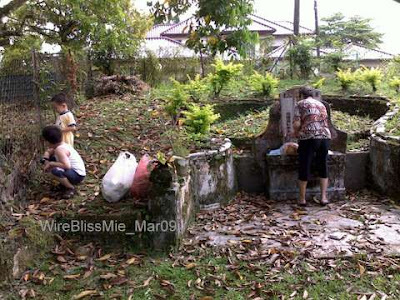 This grave here (top pix) must be one of the last one located within a house compound and within a residential area. It is located within the boys great grandfather's house compound in the city. The older generation likes to have their loved ones close to them I guess. There used to be quite a few similar graves in the area but according to MIL, they have since been relocated to proper burial grounds especially when the houses are inherited to younger generations or sold to new owners. Some were relocated to increase the value of the property. Well, if I have the choice I wouldn't want to purchase a property with a grave on its compound:) Would you? Hmm...I don't normally take photos of grave/s or cemetary for fear that the photo may show "something" else but what the heck, I was just trying to snap the boys having fun with the puppy (bottom pix).